Pioneers in the industry, we offer forged discs, blind hole forged cylinders, forging capabilities, forged bars, forged gear blanks and forged flanged shafts from India. 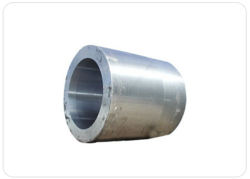 The maximum length of forged sleeves, forged cylinders and blind cylinders is restricted by the wall thickness and outside diameter. 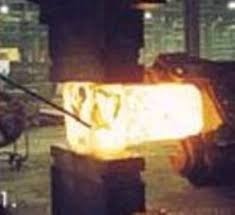 If the ratios exceed tolerances, the cylinder can either collapse in on itself or take on a barrel shape where the center begins to bow outward during the forging process. Your All Metals & Forge Group Sales Consultant will be able to determine if your cylinder ratios exceed tolerances. Forging shapes include discs, hubs, blocks, shafts (including step shafts or with flanges), sleeves, cylinders, flats, hexes, rounds, plate, and some custom shapes. Forgings can be produced as finished size, finished size rough machined, forged size, forged size rough machined, as forged size, or as forged size with allowance to finish to your finish size print. Seamless rolled rings and contoured rings are produced to save on material, machining costs and transportation costs. Maximum weight capacity 80,000lbs. 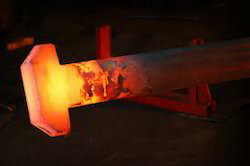 Forged metals tend to be harder, stronger and more durable than cast forms or machined parts. The reason why, is simple: pressure alone forms the steel into the right shape, and the metal’s response to such overwhelming force tends to align the grain. That means you get more cogent internal structure and a far greater ability to withstand warping and wearing. Customers from any industry that uses gears can request a quote on any quantity forged gear blanks, from one-at-a-time prototypes and low volumes to large production runs. Our expansions include gear cutting to finished gear dimensions. Flanged shafts and forged step shafts are used in a wide variety of industries including oil and gas exploration, machinery, gear manufacturing, aircraft and aerospace, energy and power generation, defense, automotive, heavy industrial, manufacturing, general metalworking, petroleum and chemical, mining, engine and turbine, ship building, construction, fabricated metal, pulp and paper, and food processing. Forged flanges are used as a connection component for pipes, valves, pumps and other equipment to form a pipework system. They provide easy access for cleaning, inspection, modification or repairs. Flanges are usually welded onto pipes or screwed onto a threaded pipe end and then joined with bolts to make the connection. Forgings are also ultrasonically tested according to the applicable ASTM, AMS, ASME, NACE, SAE, AISI or other specification. Other testing may include liquid dye penetrant testing, or physical property testing for tensile, yield, elongation and reduction of area properties.